September 22, 2012 by Meg G.
So, you may recall that I am honing my sugar cookie baking and decorating. Well, this week, I did a trial run on some chemistry-inspired cookies for a very special occasion. Our friends Caroline and Jonathan are getting married in just a few weeks. Jonathan’s family is from Pittsburgh, an area of the country that celebrates weddings with…wait for it…a cookie table! This time-honored tradition involves massive amounts of homemade cookies. I’m all in! Being that this adorable couple shares a love for chemistry, I thought I’d give these Science Lab cookie cutters a go. Good thing I did a practice run, because it looks like I’ve got a bit of a learning curve on these! I did, however, manage to solve much of my previous icing problem. Hooray! More on that after the photo tour. Doesn’t it kinda look like a bald eagle?! So, there is clearly some perfecting to do – mostly in the outlining process. I really need to pick up a smaller icing tip and to work on keeping a steady hand. The problem with these cutters are that they are VERY large (about 6inches), so that’s a lot of surface area to outline and flood at an even pressure, with a steady hand. I guess I’ll just have to keep practicing! This time around, I had fewer air bubbles, but they still bothered me. Overall, though, I was quite pleased with the consistency of the icing. I also played around with these new cutters, which I bought with the hopes of making them for my family’s Thanksgiving table. I was QUITE pleased with how these turned out. If you look closely, you’ll notice that these did not get outlined and filled. Instead, I used Sweet Sugarbelle’s 20 second icing consistency, which is somewhere in between piping and flood. This allows you to skip the outline without having your icing slide off the cookie. I’m thinking that it might make more sense to try that method with the science lab cookies next time around. 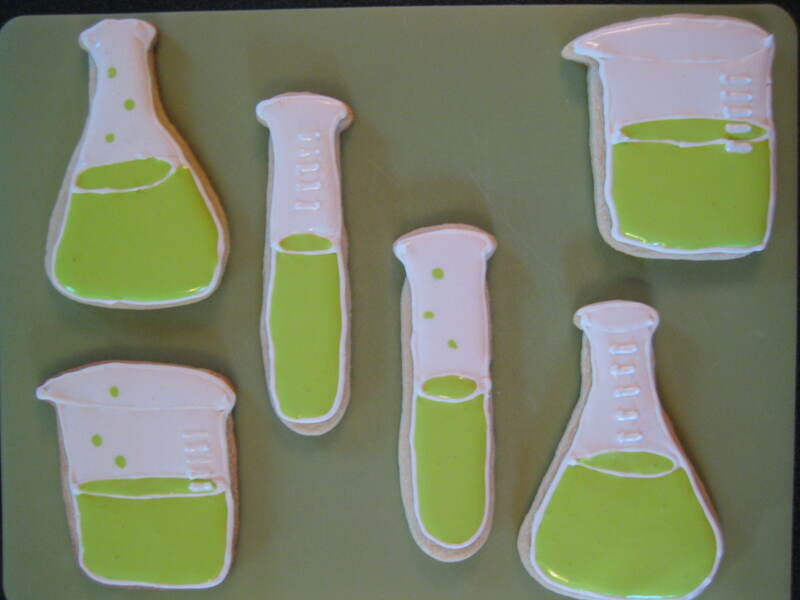 I absolutely adore the science lab cookies! Wonderful! This reminds me of my aunt and her cakes. 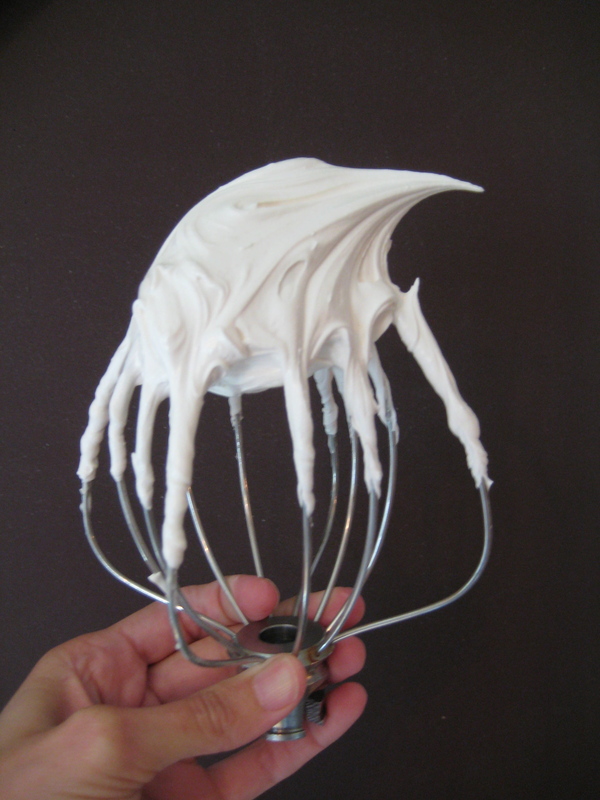 I love to lick the icing left on the steel whipping gadget. Also, I love the way you used the word chartreuse. Yay for words for different color. The science-themed cookies are something new to me. I definitely want to try. 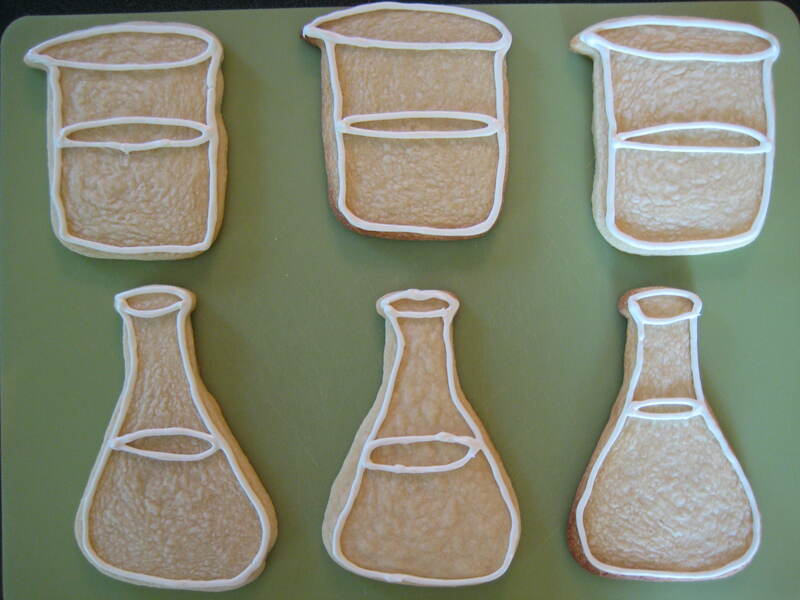 These chemistry lab cookies are brilliant, I wish I had them on the table of my degree (in chemistry) party… you definitely master the art of decorating cookies! So fun! I think I am starting to get a sense of your cookie decorating style. Thanks, Mike! I have never been to Sin Desserts – it looks delicious! Thanks for sending along the inspiration. I really wish my cookies would turn out like yours! My shapes are always messed up and then my frosting skills, are non-existent! I enjoyed this article and I want you to come bake for me this holiday season! Great post! Thanks so much. Practice makes perfect! : ) Consider this your encouragement to keep on keepin’ on! They look fantastic – well done! And yes, it does look EXACTLY like an eagle! I think all weddings should include a cookie table!! Congrats on being freshly pressed. Thanks for sharing Royal Icing recipe. I agree that the hardest part of decorating cookies is getting the consistency right. That, and a steady hand of course!! All your cookies look adorable. So creative! Love the science theme! I really want cookies now! Very cool. Cookie cutting must be in the air. I visited my niece and nephew in Seattle, and they made pretzel shaped sugar cookies the other night for after dinner. I haven’t read the other comments but… the air bubbles are from using a whish attachment, try a paddle next time for fewer air pockets. 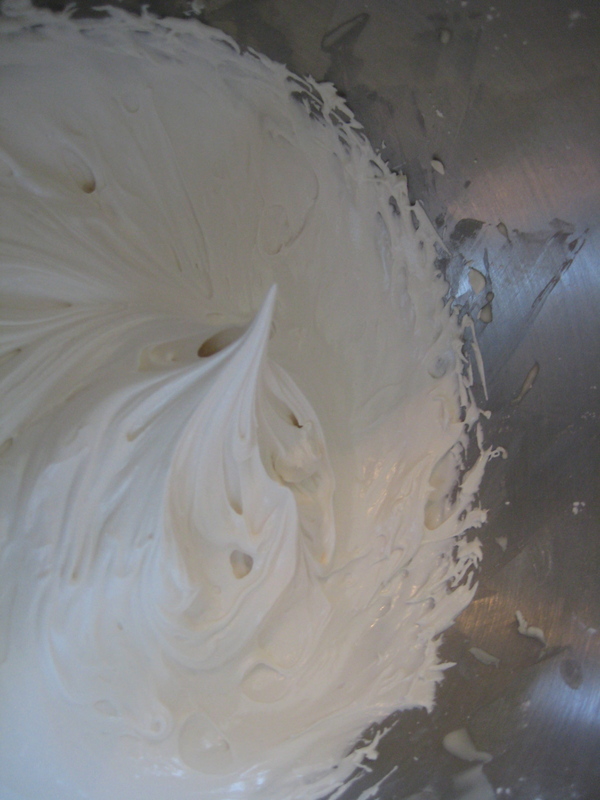 I usually start with a stiff icing, or remove enough to fill a piping bag for outlines, then add more water to the mixer. The flooding icing should be like wet paint, where a ribbon falls into the surface and disappears. That’s what I learned at a cookie decorating class at the local bakery supply shop. This reminds me that I need to get out the Halloween cutters and maybe buy some more! What cookie dough recipe did you use? Are you satisfied with it? Thanks for the tips! I actually made them with the paddle last time and the air bubbles were worse (see my Cupcake post). Boo! I use Sweet Sugarbelle’s sugar cookie recipe and I really like it – easy to make and delicious! I am working on perfecting it still, but I think it’s a great base. I love this! What fun! So cute! Wow those cookies look really delicious!!! Makes me wish we could put our hand through the screen and pick one out!!! I am going to bake on weekends now!!! Thanks!!! You give me hope. I can’t bake cookies for crap. I love the science cookies! My friends and I are kind of science nerds, so I think they would appreciate something like that at our next cooking party! Reblogged this on Rosario Chary. These look really good. Very creative too! Chemistry never looked so delicious. I always love the “geek” cookies. I find royal icing rather fickle. I can never really get it to be the right consistency. You did a lovely job! Thanks! 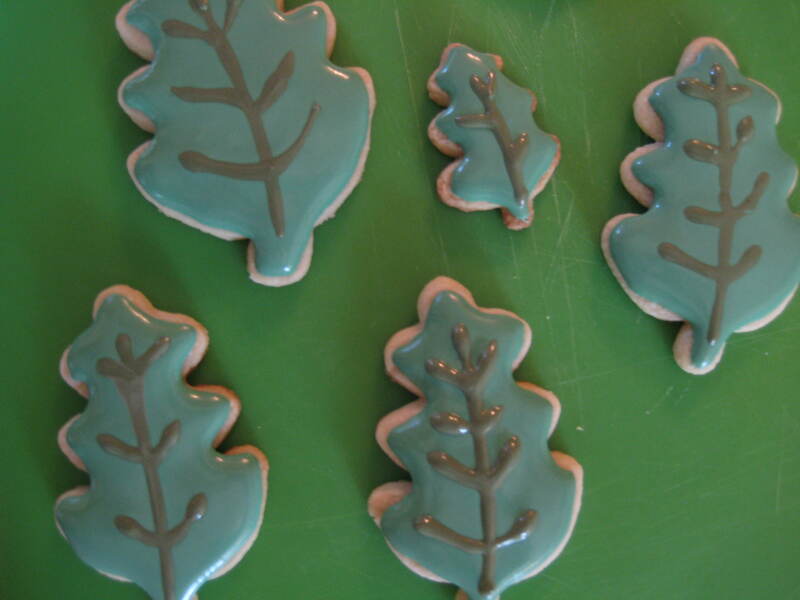 Callye over at Sweet Sugarbelle has some great hints and videos about royal icing consistencies. Best of luck! Thanks so much! Never too early to get kids interested in learning. Have fun baking up some science geekery! I love it. Look delicious! I truly loved this post! Very creative and fun. Love these, thanks for sharing!! Reblogged this on An immigrant girl. Nerd cookies, I love it. Last Friday, I ruminated upon a space-shuttle-shaped cookie cutter, too. Awesome – I’ll have to go check out your space-shuttle cookies! These look great and make me want to do some baking. I’m sure your friend would get a kick out of them! The cookies stay for a good couple of days when stored in an airtight container, so I think they’d hold up pretty well if shipped. I just want to sit and eat all of that icing! I looks sooo wonderful. Um, yeah I’m a sugar addict. Not sure if it’s just the area of the country for cookie tables at weddings – it’s tradition at all Italian Weddings. All of the cookies look great, you did a nice job! Thanks! Yes – it’s definitely an Italian tradition as well as a Midwestern one! I wish everyone would celebrate their weddings with cookie tables 🙂 Great idea, I especially love the test tube cookies! They look sooo good!! Thanks for sharing! Wow!! This is sooo cute!!! Love it! These are ….RAD!!! Awesome cookies!!! Oh yum! I love sugar cookies– not sure my dentist feels the same way. Cheers! thanks for providing this frosting recipe! Its so hard for me to get the perfect consistency sometimes! It’s definitely tricky, but Callye at Sweet Sugarbelle has some really helpful hints! Love the fall cookies! They look sooooo yummy! Thanks so much! The autumn cookies were definitely easier than the chemistry ones. I recommend trying them! Nice Cookies and their shapes! I LOVE these! Those little beakers and test tubes look delish. Nice post! 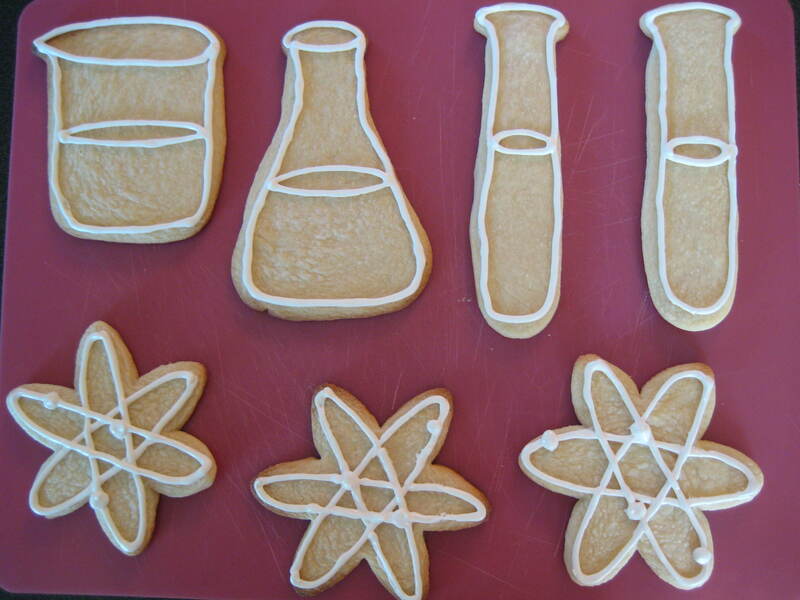 Your Chemistry cookie cutters are really cool. However, what I really like is the techniques that you used to frost the cookies. They look really cool and would make a great addition to a party for someone who likes science. Great post! 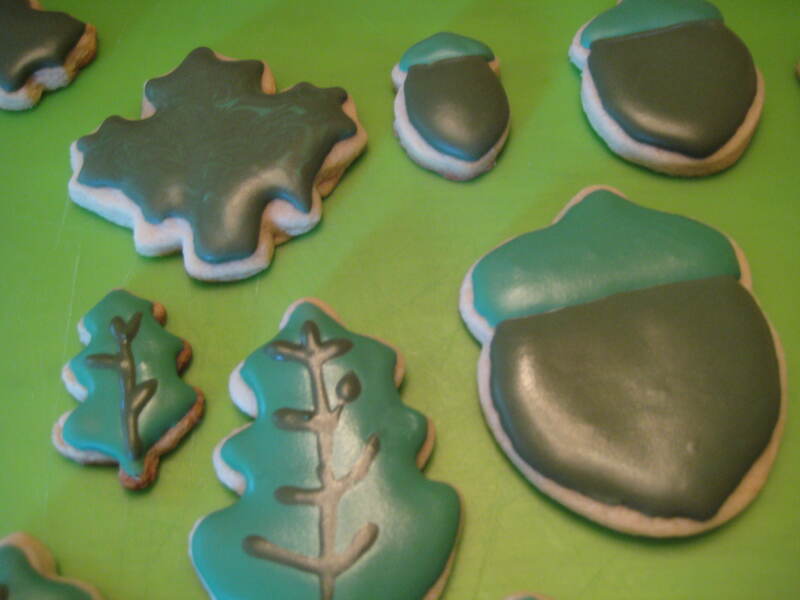 I’m always experimenting with royal icing, might try those ratios next time, thanks for the share! Thanks! I hope it goes well next time around! These are awesome! 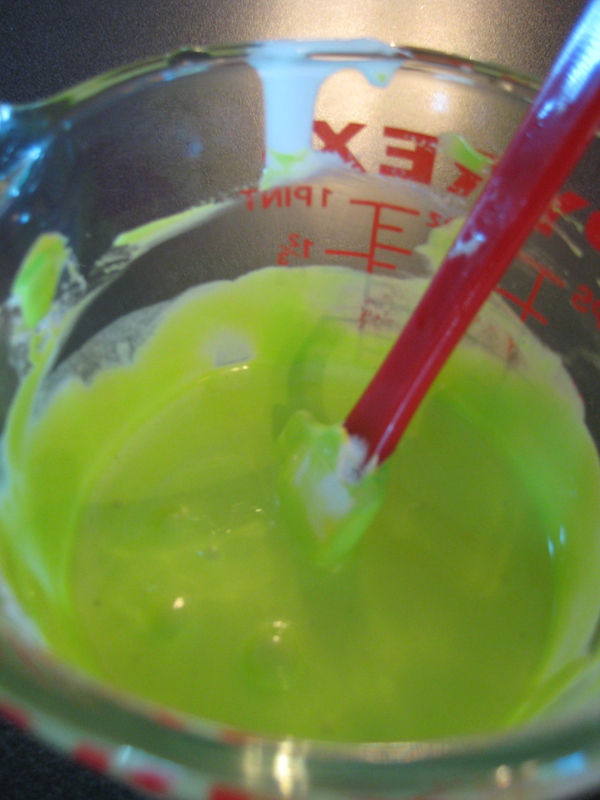 A great breakdown on icing cookings, it’s a task that has always seemed so daunting to me! I may be able to take it on now. Thank you for sharing! Thanks, Julia! If you check out my Happy Birthday, Cupcake! post, there are some more helpful hints and links. Best of luck – it’s a fun and delicious hobby! I’ll be sure to check it out. I’ve made some cupcakes in the past, but my icing seemed to slip off them and wouldn’t be formed/shaped at all. Thanks for breaking it down, that helps MEEEEEEE! I need to learn to make RI in smaller batches since I don’t really sell cookies anymore. And your eagle cracked me up! Yes it does! Hello, Callye! I’m a little star struck, but so glad to see you here and glad that my smaller batch recipe could be helpful. Not sure it’s perfect, but let me know what you think!